A winner is you: As mentioned above, Mike Piazza was named the 1993 N.L. Rookie of the Year. Here are some other awards and honors this slugging squatter has taken home in his lifetime. 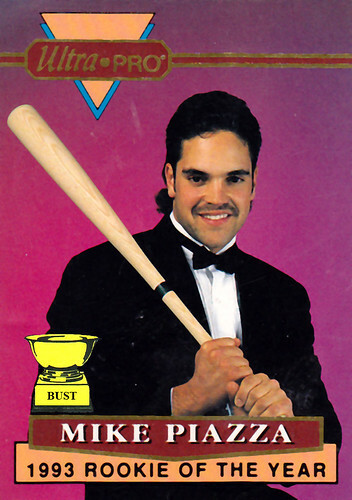 Won an Oscar for Best Fictional Screenplay for "Mr. Piazza Goes to Cooperstown"
Hi i'm looking for the value of card 4 & 5 of mike piazza 1993 rembrant ultra cards also looking for cards 1,2,3, and 6 to complete my set.